To say this semester has been frustrating would be an understatement. I’ll admit, I assumed I could walk right into the journalism world and just take it by storm. I was very much unaware of just how much goes into this career. Through the help of classmates, Nicole, Natalee, and the innovative class structure my frustration level has dissipated greatly. The last assignment due for the class was the second part of our mid-term. This consisted in finding a story, interviewing sources, and writing the final draft all within 24 hours. Considering we have had a week (at least) to write even our rough drafts, this was going to be no easy feat. This assignment was very nerve-wracking to say the least. I must say though, reading tweets from classmates who were having similar experiences helped a lot. To be honest, I secretly think Nicole enjoyed reading and watching us squirm! Once I started with my story (on Eddie George’s Grill and their March Madness events) things went much smoother than I anticipated. It wasn’t the most newsworthy of articles, but once I spent as much time as I did starting it, and with our close deadline, I felt as though I had to stick it out. I was able to get my interviews quickly, and knock the story out. I guess I was one of the lucky ones, as many had trouble tracking down qualified sources in such a short amount of time. Finding a story and sources is ALWAYS the hardest part for me, so once I was able to do that quickly I felt very good about it. Overall, once I got over the initial WTF moment after hearing we had to do the story in 24 hours, it wasn’t nearly as bad as it sounded. It was also a great experience, because let’s face it … what journalists get 2 weeks to write a news story anyway? A great part of this class, and as I previously mentioned part of the innovative class structure that has helped me become more comfortable, is iTunes U. iTunes U enables us to watch course lectures along with supplemental videos and articles related to class materials on our own time, as often as we want. As awesome as that is, the best part of this is that it allows us class time to write, story find, and talk about stories rather than go over definitions and such. This is my second class with Nicole, and my second class using iTunes U. I really hope this starts catching on with other classes. I don’t think professors and students really get how much it adds to the class. Having the flexibility to spend 20 minutes debating with classmates (as done a lot in Media Law) without worrying about falling behind on lectures was amazing. I think that is the kind of stuff that students learn from, and what gets them excited to go to class. Not the lectures. Honestly, I really like this thing a lot. Having had an iPad mini for a few months I wasn’t sure how it was going to work having an unattached keyboard and a smaller screen, but it is actually really great! The flipped classroom idea is wonderful. I have yet to have a class where I’ve learned this much this quickly. I feel almost like I’m an actual journalist, and that’s not even what I want to be! The iPad works really well for note taking and writing, Pages is a great tool and it’s simpler to use than Word on a laptop because it’s not trying to be fifteen different programs at once. I used Notability for the first time during one of my interviews and was able to type up quotes and record at the same time, which was invaluable when going back and checking for accuracy. The only qualm I had with the iPad is iMovie for making videos. I find that using a touch screen for that sort of thing is very difficult and I ended up shooting the video on the iPad, but then syncing it with my laptop to create the video. As for iTunes U, I love it! I find that having a calendar feature where all of the assignments for the day are available and can be checked off is very useful. I truly wish that was available for all of my classes and that we could simply do away with Carmen. The iPad has been a great tool and I very much hope that OSU will consider utilizing it, iTunes U and the flipped classroom model for future university courses. The bare stage, artistically lit, adorned with just three director chairs and framed by a movie-sized projection screen bearing the Apple logo, seemed the perfect setting for one of the computer company’s familiar product launches or insightful tech instruction. There was only one major difference at this event: This time the stage was set for me. Hard as it is still for me to believe, I was front and center for the launch of Apple’s newest educational video series, this one promoting the academic product iTunes U, and illustrating how I use iPads to move my class environment and instruction into a tech-based 21st century. Months of prep, hours of rehearsal, a trio of outfit changes, a lighter coat of nail polish and half a can of spray to keep my wandering hair out of my left eye, resulted in an hour-long interview and demonstration of iTunes U at the Apple Store in Soho, one of a handful of company store’s in the world that have a performance stage. It is hard to believe it has been just over a year since I first heard of iTunes U and bought my first iPad, with the goal of building one course–that’s right one–in exchange for an Ohio State-paid trip to Apple headquarters in Cupertino. In eight months, one course became four, followed by an iBooks textbook. A grant application resulted in one-to-one iPads in my news writing class. Somehow, someway, we also caught the eye of the true Apple geniuses–the ones who make, promote and educate us on the products that have become so instrumental in every aspect of my life. The email came in October–Apple wanted to offer a new video series to showcase Apple in education, and would I be willing to help them launch. I had little idea at the time that “help” meant be the sole presenter, and the educational materials they would be showcasing were exclusively my iTunes U courses. A student to join me was requested, and I was thrilled to welcome aboard the lovely and talented Karlie Frank, who had shown incredible initiative and skill by covering a story in the third week of our Autumn 2013 class that made the front page of The Lantern. That excitement turned to absolute joy when I saw Karlie’s professionalism and preparation on display through hours of phone rehearsals. Sooner than we could believe, we were headed to New York on Jan. 28 (sub-zero Midwestern temperatures be damned) to meet our benefactors in person and to begin two days of immersion in the word of perfection and preparation that is Apple. A trip for breakfast to a true New York deli (bagels and lox anyone?) made Karlie and I 15 minutes late for our first meeting, but we tried to make up for it with prep and participation from 11 am to nearly 11 pm the day before our shoot. Apple’s goal for us from the start was clear: Be as organic as possible, tell our story the way we lived it, help others see the vision from which we worked. Our breaks were few but filled with frivolity, friendship and families. We shared stories and photos of our kids, related tales of our histories and shared interests. We gelled together in pursuit of a wonderfully greater whole. If it sounds like work, I have to correct that impression. It was more like being a surfer perched on a wave taking shape into a perfect curl around you. You love it. You crave it. You wouldn’t want to be anywhere else. And our Apple friends were the forces of nature that would not let us falter or fall until we had ridden that wave smoothly, beautifully to shore. A dinner break introduced us to Dr. Jason Corosanite and Christine DiPaulo, a pair of Apple Distinguished Educators from Philadelphia, who had started the String Theory Schools (not far from my alma mater of Temple University) using iPads and iTunes U to transform K-12 education in the City of Brotherly Love. Within 10 minutes, we were deep in conversation about how we are using technology to morph and change and evolve education, meeting our students where they need and want to learn. It was like meeting lost members of the same family, who incredibly talk and think and sound as you do. By minute 30 we were talking collaboration and making plans for how we could continue to recruit others toward our collective educational goals. By the end of two hours we were hugging like the best of friends we had become, kindred spirits that see a future made brighter by connection. When we got back to the Apple Store, what was a stage had become a studio, with producers and key grips, jib operators and sound technician, who set up microphone and seats, and figured out how best to transition from iPad to laptop without me whacking the boom mike (you know I would). Almost without blinking (and certainly for me, without sleeping), there we were, sitting on the stage, five cameras capturing every word, movement, tap and swipe. The audience was compact but mighty, including our friends from String Theory; Karlie’s mom, Michelle, and sister, Kim; my wonderful former student T.K. Brady, now working for a New York magazine; educators from New York colleges, a community college librarian; and dozens of others. Walking on the stage was a bit like meeting my husband at the end of the aisle on our wedding day–I can barely remember the journey, but I sure remember the destination. I could say Karlie and I were nervous, but that would truly be a lie. We were as prepared as we could be. We knew our subject inside and out. And we believed in our message and those who helped us be the messengers. After an hour of talking about our course, showing how it’s navigated and created, explaining how and why we do what we do, and answering insightful (and quirky) questions, the applause came, the cameras stopped filming, and it was over. I knew it was more than OK on Karlie’s part–she was mature beyond her years, clear, concise, beautiful and inspiring. She represents everything about why I love teaching so much. I still have moments I wished I’d said more–or less–but perfection is a slippery concept, and I hope words filed with passion are as, or more, impactful than words expressed to perfection. The next few hours flew by in a blur, before we were off to a cab, off to the airport, off on a plane bound for Columbus, and it was like the clock had struck midnight on our amazing evening at the ball (Coincidence that Apple’s Soho store is on Prince Street? Maybe not). That night we crawled into our familiar beds. The next day we headed to class at Ohio State. It was like it had never happened and life was just the same. I was not the same. No one who works alongside passion and professionalism, vision and expertise, genius and gentility should be the same. I feel smarter, my eyes wider, inspiration of what could be done next to take education even further bubbling in my brain. In the days to come we will no doubt regale our friends and family and coworkers with the story of Nicole and Karlie’s Excellent Adventure. We will remember, and we will say thanks. Thanks to Ohio State, for having the vision and commitment to let faculty like me embrace the future of education and make that future now. Thanks Mike Hofherr, Cory Tressler and the rest of the Office of Distance Education and E-Learning, for opening the doors to that future, and providing the tools that let me see a vision and turn it into revolutionary reality. And last but never least, thank you Apple friends new and old, for letting us into your world to share with others our vision and the success we have enjoyed in our Ohio State classes. It is only just the beginning. After two weeks of reflection, it’s time to sift through the feedback from Comm 2221 and the first generation of Ohio State Mojos. Our first iPad adventure comes to an end–and a new one will soon begin. As I mentioned in my past post, from my perspective, the iPad did exactly as I had hoped. It made the ones who wanted to be journalists more mobile and successful. They accomplished skills much faster than prior classes. It also proved stressful and tiring for those students who were less inclined to embrace, and more than one said they are not interested in being journalists based on the amount of work and the constant and focused editing it entails. I loved the organization of iTunes U, and students in both class in which I used it (Comm 2221 and Comm 3404) resoundingly supported the flipped class. I loved this class, really made you think for yourself especially with the flipped classroom. Absolutely loved. Flip more classes! But I also learned much from the criticism of this experience, especially the anonymous class evaluations that said he or she felt the iPads interfered with teaching the class and had too much of a focus. I certainly respect that view and aim to make it more a part of the experience than a focus. Nicole is tough. yes definitely. However she is the right instructor to have if you just start your journalism major and try to figure out if you made the right choice. With her I learned so much about real life journalistic skills and am really excited and proud of being a journalist. But rather then me telling you their reflections on the iPad, here is a sampling the feedback in their own words. This semester has been amazing. I have loved using the iPad and become more comfortable using it than I ever thought I could be– I’m thinking about asking for a mini for Christmas.I really enjoyed shooting photos and video. I thought the quality would not be great and would take away from my multimedia, but I was wrong. The quality was perfect for my use. Over the course of this semester, I get a sense that my classmates and I have bonded with our iPads. Many people have laptops that are collecting dust in their rooms because the iPads have been a more convenient alternative for use in all of their classes…If anyone ever faced a technological issue, everyone was involved in class and we worked together to figure out a solution. I used iTunesU for the first time in this class and I wish every course at OSU had iTunesU supplements. At the beginning of the semester, using an iPad to complete all my course work for this class did not seem possible and stressed me out just thinking about it. I decided that I needed to stick with it and challenge myself this semester and that ultimately it would be worth it. I’m happy to say I was right and I believe that using the iPad, although frustrating at times, was rather convenient to carry around to report news with rather than just a notebook. Will I buy an iPad? Nope. Not gonna spend money on a little laptop that I’m not very good at working. I have my cell phone and my camera to take pictures with and my computer for everything else. Again, let’s remember that I’m not a huge fan of technology, so I’ve been anti-iPad since they first came out…nothing against this class or their usage in here. I do appreciate the opportunity to use them and to learn for sure that I do not need to go out and spend $500 or however much these are just to “fit in” with what the cool kids are buying these days. The iPad has been a great tool for reporting news in this class. I definitely would recommend it for the future. I have an iPad myself, and this class has encouraged me to learn how to use it in different ways. I now have more knowledge of certain apps and ways to use it that can help me in the future. Although I did learn a lot, I feel like there were times when I had no idea how to use an app or I didn’t think that an app was helpful. I wish we could have had more time to go through a lot of these apps and explain how to use them, because the ones I didn’t know how to use, I avoided more….The iPads were really intimidating at first, but they became the most useful tool I used in reporting this whole semester. Throughout my news writing class (Comm 2221) at Ohio State we have been given the challenge to become mobile journalists, as I’ve mentioned before. This challenge was really exciting at first but has now presented some frustrations. My first frustration is with the WordPress application for the iPad. I can log in everywhere except on my iPad which makes no sense! In addition, every time I try to paste something into the body it pastes into the title. I have since decided to stop using the application all together. Another frustration is that my iPad disabled itself somehow….It’s been an interesting journey to say the least! I was not familiar with iTunesU before this class. I now realize how awesome it is. I really enjoyed having my textbook on the iPad, and the ‘calendar view’ was awesome! I plan to utilize it more as I move forward. I wish we would have done more with multimedia….Overall, I really enjoyed the class and thought it was structured in a way that was manageable, but also promoted a healthy learning environment. I can honestly say that I learned a lot! Now the semester is ending and we have had this whole time to use the iPads in our own ways to report news. So how well do I think I used my iPad…? Personally I think I could have been way more effective with using my iPad specifically for this class. In terms of reporting news I was very intermediate with everything. I only used the iTalk app to record interviews and then would take notes on the interview later on on my laptop and then put them on my iPad to write my news stories on Pages. I did write almost all of my stories on the iPad, except for the last one just because it was longer. This isn’t to say that I don’t think iPads are worth it to have as a student. Having the iPad to use this semester was an invaluable experience and I would definitely want to do it again next semester if I could. It was sooooooo much easier to carry around the iPad than my big, heavy laptop to classes to take notes or look things up online quickly. The iPad made much of my day-to-day school work that much easier. I definitely think that if I had the money I would buy an pad of my own to have and use from now on. This class has been enjoyable and fun with the use of the iPads. Definitely a recommended class to friends in communications. Overall using the iPad in this course was easy and an asset to our learning and reporting. At times it was frustrating when certain apps wouldn’t work right or we couldn’t figure out how to do something on the app version, but overall it was a good experience. The apps I used the most were WordPress, pages, the AP Stylebook the news apps and twitter. I never really used the Skitch, Penultimate, or Evernote apps. I feel that the apps you provided us with were all I needed to be successful. The iMovie app is terrible compared to the desktop version, so I might encourage students to find a lab with the program if they are planning on putting together professional looking videos, the app doesn’t give you enough to work with. If I was planning on going in to a journalism career I would definitely invest in some sort of tablet or iPad to work on, it is much more convenient to carry around and easier to have everything you need on one device rather than carrying around a camera, a video camera, a recorder, etc. …[A]t this point in time I do not see the benefit in having an iPad. With or without the iPad I still felt the need to have my Macbook Pro with me at all times. With that being said I do not think it’s beneficial to add weight to my backpack that does no more than my Macbook which I carry at all times. After this semester I probably would buy an iPad, if I had the money for it, even though I’m not really continuing on with journalism. I love it as a way to read all kinds of news, especially with the AP mobile and Dispatch apps, and the Washington Post. It was also useful because I ended up having another class with lectures on iTunes U, and I could see myself having more in the future. I just found it generally pretty useful for all classes, and if I had more down time to read this semester, it would have been really awesome for that. I liked using the iPad for writing news stories but I found that for other projects in other classes I would still turn to my laptop. It was hard to transition from using the laptop to the iPad and I think I can still use the laptop more efficiently. The iPad came in handy for me for quick use, such as when I wanted to check something on Google, but I think I will go back to using my laptop after this. I am not against iPad first of all. I myself have an iPad (although it’s a gift from my friend). But I do not see the necessity of having it. Talking about high tech, we have our laptops and Macbook. Talking about convenience, we have iPhone or just smart phones especially when iPhone becomes longer and longer along with iPad becomes smaller and smaller, I do not see the reason why both of them exist. I definitely think we should seize the iPad use skills because everyone else knows how to use it. If you do not know how to use a new technology related to journalism skills as a journalist, it is hard for us to find a job when we graduate. It turned back to the beginning of this class. All we are doing here is to find us a job! So I do not think my opinions here really matter. I will try my best to like or at least to not hate it and be used to it in future uses. I loved the newsroom days where we pitched ideas. I loved being able to have the iPad to type up my ideas instead of breaking my back by bringing my laptop, it also made the process better because it was more conversation, easier to flip between pages and apps, and more interactive by being able to show my peers what I was talking about and even passing around the iPad if need be.I hope that future classes get the opportunity to use the iPad. It seemed to make us excel better than previous classes in our learning process and specifically with AP style. While this did create some stress initially, this became one of my favorite classes because of how I was challenged, motivated, and pushed. This semester the classes that I didn’t do as well in we’re classes that didn’t teach me new skills or set a high bar for me like this class did. I have loved using the iPad this semester. I have enjoyed using the iPad for not only my journalism work in Comm 2221 but also to aid in my other courses. The iPad is used friendly, easily portable, and keeps its battery charge for a very long time, which was more convenient than my MacBook Pro. As a journalist in our society, one must be able to market themselves using the Internet and social media. These online tools are the new keys to journalistic successes, and the iPad helps to easily integrate these practices for a journalist. Not only can you produce high quality pictures and movies to supplement news articles but I easily accessed applications to integrate Twitter and my WordPress with my articles as well. I used the iPad for notes during interviews with Evernote and for recording during interviews with applications like iTalk. I became a mobile and fast-paced journalist while using my iPad this semester. I got very good at typing on the iPad and easily moving between different applications. I will miss my iPad a lot after this course, not to mention it really lightened the load in my backpack. I have told my parents how much I loved the iPad and how easy it made my portable journalism and coursework. I am hoping one day I can purchase an iPad and use it again for my reporting. 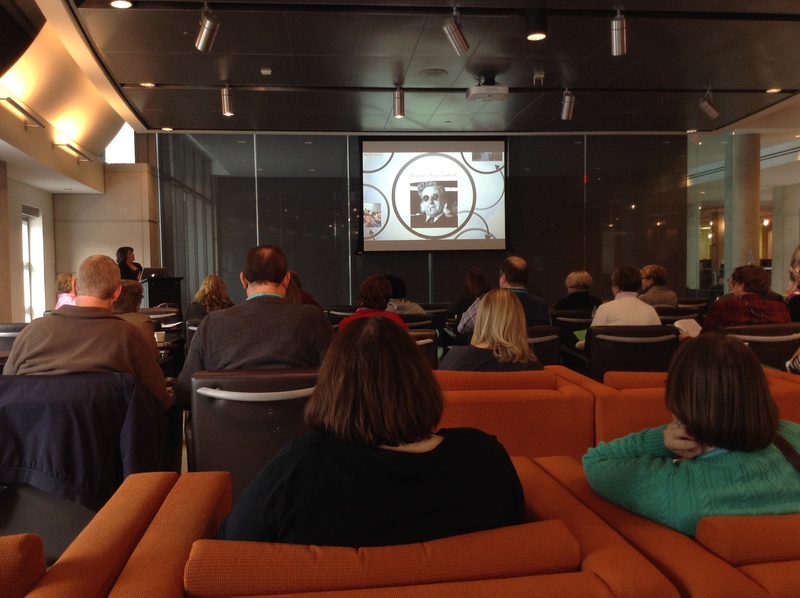 On Friday, December 13, 2013, Nicole Kraft was the keynote speaker at the OSU Library Teaching & Learning in-service day. Nicole discussed her Digital First Impact Grant, iTunes U courses, iBooks projects, and flipped classroom instructional approach. Tomorrow will be the last “official” class of our Comm 2221 iPad Newsroom, although we will gather once more during finals week for one final moment of passage: the return of the iPads. One of my favorite parts of the semester: Seeing Comm 2221 students like Maddie using their iPads in other classes. It is hard to believe how quickly 15 weeks have gone by–and how much of a roller coaster we have been on. I have seen the iPads become second nature for so many, as they navigate through apps and files to make assignments that seem to leap from the screen. As the articles got more difficult, however, I also saw some students pull back from the new technology to rely more on that which they knew. The flipped classroom executed through iTunes U became what we hoped–a self-contained learning environment, for students to take their class learning with them at home and on assignment, and the knowledge the brought to the class newsroom each week to execute the stories we needed to write was inspiring.One student even told me how she whipped out her iPad at a family gathering to prove the legality of one-party recording in certain states. We had an extraordinary amount of sickness this semester, and the lectures allowed students who missed class to not miss out on learning–or rely on others’ notes. Grading on the iPad allowed me to return articles in half the time to allow even more revision or work together in office hours, and probably saved a small grove’s worth of trees. All told my students spent $2.99 on reading materials for the class, and only a handful spent any more on additional apps or a bluetooth keyboard (to be supplied to the next class, thanks to money left in our Digital First grant). Not all was completely rosy, of course. I did not factor in enough times to go through the apps, and many wonderful and handy ones were left unopened. We will address that better since the iPads will be ready to go from day one, as opposed to the week-plus delay we faced in Autumn. I also overestimated comfort on our data story assignments, and the lack of source cooperation made that early assignment frustrating–a mistake I will not make again. A previously unconsidered ramification seems to be that this push to become multimedia journalists solidified the path for whose who were or became committed to the craft. To those who were less sure, the push toward multimedia has promoted them to rethink their major a bit quicker than they may have in the past. In past semesters, it was the speed or quantity (quality) of The Lantern class that may have turned them away from reporting. For others, our multimedia class could have been a tipping point. But this semester, Comm 2221 gave them a sample of all those pressures and responsibilities, some did not feel it was the right path for them. For the students who became enamored and entrenched in journalistic technique, the iPad did all we envisioned it would. The world of multimedia reporting opened up and they created packages of which they had not even before imagined. One student who came from Agriculture Communications and was reluctant about the iPad and worried about his own writing skills produced one of our best feature projects, complete with video package. Even he, however, acknowledged that certain skills are better utilized, when possible, on the laptop–such as video editing and WordPress blog navigation. I am truly sad to see this semester end, for we came together to be quite the community and do some incredibly work. But I just as excited to begin the spring semester, which will allow me to use all that we learned to make even greater strides forward. The newness has worn of and as we roll into the last month of the semester, we seem to have reached what is, for us, the new normal. We started with everyone writing everything on the iPads. Slowly, we have moved over to writing notes on the iPad, but an average of eight (29 percent) are using the laptops to write their articles after taking notes. The reason given: It is just easier. We have been staging deadline writing assignments in class: a police press conference, speech coverage and a midterm that gave 24 hours to find, report, write and turn in a story based on one of three prompts. In class, that percentage stayed consistent, but it rose to 68 percent laptop usage when students were faced with midterm pressure. In the AP style portion of our midterm, students took a 50-question exam consistent with prior semesters. The use of the AP style app as a learning device seemed to better prepare them for the questions, as we had an average of 79.36 compared with 69.4 last semester. We are also winnowing down the apps that we find useful. Twitter, Hootsuite, Facebook, all useful. The AP Style book, Evernote and Pages are staples. Evernote and pages are the primary note taking and article writing apps, although some prefer just the notes that come standard on the iPad. The fact that Evernote is accessible on all IOS devices makes it almost magical. We have found too many bugs to make WordPress worth using, and it has impacted the blogging section of our classwork. We have edited on iMovie, although the desktop version was vastly preferred and will likely be used for the remaining assignments. Limitations with iMovie include being unable to bring in outside video, limited lower thirds and labor-intensive editing tools. Tripod usage has increased as the video demands continue. Four of the six were checked out for the midterm. Keyboards are not being utilized as I expected, with students opting to go for the laptop first. I plan to introduce immediately next semester and see if there is more interest. Although six people have bought styluses, few are intended for fine writing, and they are not using apps to take hand-written notes. Finally, we have finished watching all the class lectures assigned this semester, but I have just started reminding them to revisit certain lectures, as we write features articles and prepare for a multimedia final project. The fact those resources are maintained in their entirety and so easily recalled is proving popular. As our semester winds down, it is amazing to see all the work they have produced, but also all the ways in which I can improve understanding and use of the iPad, as well as more ways it can sing and dance in our academics. I am already looking forward to Spring 2014.